Belcastel began its life in the 9th century as a village chapel. Over the centuries it took on more the appearance of a defensive fortress at the hands of the lords of Belcastel. When these lords suffered great misfortune during the Crusades, the Crown took over the property and awarded it to a favored knight named Saunhac. His descendents completely renovated the castle and built the bridge and church that are beautiful highlights of today’s village. The last Saunhac heir abandoned the castle in the late 16th century. A villager bought the property a hundred years later and sold off many of the stones, causing further dilapidation. French architect Fernand Pouillon, upon returning to France from a self-imposed exile in Algeria, came upon the ruins of Belcastel and fell in love with them. For eight years, he and ten Algerian stone masons, quarried stones from a hill above the château and rebuilt the castle by hand piece by piece. No cranes or machines were used. His efforts inspired the villagers to also restore their properties and beautify the village. When finished, he moved into the castle and resided here until his death in 1986. Belcastel is a private castle that lets out just one suite to guests, so it’s not your usual full-serviced hotel. If you want something unique and exclusive, you’ve come to the right place. Belcastel is about 150 km northeast of Toulouse. From N88 continue on D911, right on D997, and right again on D285. The castle is in the middle of the village. The nearest train station is at Rodez; however, you really need a car to get around the region. The Château de Belcastel is a special place. You have to imagine being the only overnight guests in a tower suite that overlooks one of the most idyllic and charming villages deep in the French countryside. The castle belongs to an American couple, Heidi Leigh and Nicholas Leone, who have brought their expertise from their New York fine art gallery to this medieval architectural gem. Many of the restored rooms of the castle host revolving art exhibitions that are well worth a visit. Everything you could want in a romantic hideaway is here: a drawbridge crossing over a moat, a private patio, and a 10th-century stairway that leads up the ancient tower to your suite. On the first level you’ll find your living area, with a welcoming bottle of local wine, a leather sofa, small refrigerator, DVD player, and a wood-beamed ceiling overhead. On this level, too, is the bathroom, which comes equipped with a shower and a small tub. Up a curved stairway to the second level is your bedroom highlighted by a queen-sized bed and antique furnishings. 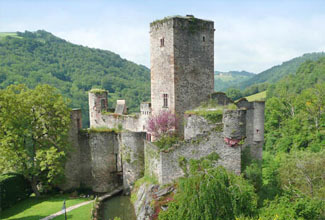 From the stained-glass windows are views across the Aveyron countryside, the village of Belcastel, and the drawbridge and moat. As a guest of the castle, you’ll have free access to the rest of the property, the picnic grounds, and the seasonal swimming pool. The village of Belcastel has four well regarded restaurants within walking distance of the castle, including one with a Michelin rating.